We're still about a week away from Samsung's grand MWC 2016 event (where the company will officially announce its brand new Galaxy S7 series of smartphones), and yet we already know a lot about the upcoming handsets. What's more, we've seen various images showing both the Galaxy S7, and the Galaxy S7 edge. In case you haven't had enough, or you have any doubts about the authenticity of the previously leaked images, a new set of renders was published today, this time only showing the Galaxy S7 edge (which reportedly sports a 5.5-inch display, thus being larger than the regular S7, which should have a 5.1-inch screen). 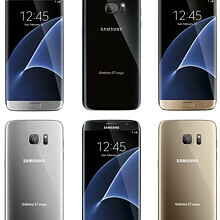 The new renders - revealed by @evleaks - show three color variants of the Galaxy S7 edge (front and rear sides): black, silver, and gold. As mentioned plenty of times before, the S7 edge looks a lot like last year's Samsung Galaxy S6 edge, though there are some subtle changes, including the fact that the new smartphone seems to have a more rounded back. Just like the Galaxy S7, the Galaxy S7 edge could be released around the world on March 11. Prices for the S7 edge might start at $799 - $100 higher than prices for the regular S7. It's said that the Galaxy S7 series will bring plenty of improvements over the S6 family, including dust- and water-resistance, microSD card support, superior cameras, and larger batteries (3000 mAh for the S7, and 3600 mAh for the S7 edge). To find out more about Samsung's next flagship smartphones, check out our Galaxy S7 rumor review. And let us know which Galaxy S7 edge color variant you like best, okay? Not fan of gold color, too flash in my opinion. I wish there is a gunmetal option (which probably wouldn't happen). They should get rid of that slippery, fingerprint magnet stupid glass back. Much better than tacky cheap plastic. Or replace the back with sapphire glass. It would look classier and marque's of distinction. I would take back the leather like plastic on the Note 4 over the glass. And I am a believer that glass isnt premium, metal, leather, and carbon fiber are. But hey, maybe this is just me. Ceramic and sapphire glass are premium. real leather yes, not cheap plastic leather. I would love pure copper or brass. Not every plastic is cheap. I am going to primarily be talking about Apple and Samsung because Apple are the biggest pushers of Aluminium phones and Samsung seem to cop the most from people about their plastic ones. I do mention HTC, LG, and Sony; and Apple's name could easily be replaced with HTC and Samsung's with LG/Sony/Motorola but the post would have less contrast. Following the iPhone 6 Plus bendgate stuff, and the subsequent testing of a lot of other mobile devices on the market, there is still such a huge emphasis on how a device "feels in your hand", and the "premium materials" a device uses. Every single review, without exception, that compares a device using an aluminium chassis/case (iPhone, HTC) with one using a plastic chassis/case (Samsung, Nokia, LG) will always give "build quality" to the aluminium phone. Usually citing that the aluminium feels more premium in your hand. What is a premium material? What defines a premium material? is it an expensive material? or a material that is rare? a material of high quality? If it is any of those 3 things (price, rarity, quality) or a mixture of those 3 things, why is thin aluminium considered a premium material? You should realize that even "cheap" plastic is better than glass back. Glass is expensive than aluminium and metal. Any products made with plastic is know as low grade dirt cheap. Sapphire is more brittle than tempered glass. It world shatter more often. Sapphire is not brittle or breakable. Look at expensive watches. Sapphire is not breakable ? LMAO! Are you serious ? It just takes more to scratch sapphire but in any case, you can break it quite easily. Don't mistake break resistance and scratch resistance. The Oneplus One doesn't have any Magnesium you can see or feel. That border around the sides is plastic, the Magnesium is the inner chassis, which is no big deal, the S3, S4 and S5 all had that and they didn't mislead people with it. They didn't mention it. Thought the tough samdstone back was magnesium, also heard that in some reviews...just wasn't flimsy like on the Galaxy S series. Are you going with the s7, or Note 6 bro? Right on bro, be cool. That was quick for m9+. You ve got a9 now. You mean htc a9 or?